Calling all kids ages 6-12 looking for fun and adventure! 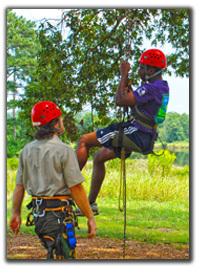 Camp attendees will have a blast enjoying various activities during this popular experience. These will include archery, a hayride, crafts, games, snacks, and more! $75 for the week. Registration required. (912) 884-5999 $75. 912-884-5999. Assist with sprucing up the fort by doing minor maintenance and clean up projects. Lunch and goodies provided as well as a good feeling for giving back to nature and the park. 912-884-5999. The event commemorates Colonel John McIntosh's defiant reply to a British demand for surrender: "Come & Take It!" Watch colonial demonstrations, musket and cannon drills, 18th century music and wreath laying ceremony by the Sons of the American Revolution. $3-$4.50 912-884-5999.